As early as 1903, Hetch Hetchy Valley in Yosemite National Park was identified as a site for San Francisco's water supply. 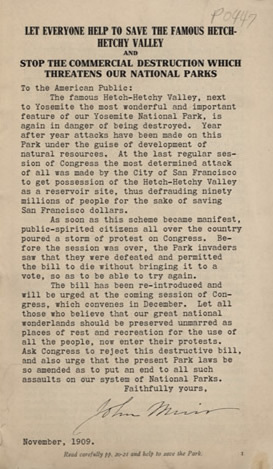 Naturalist and conservationist John Muir opposed this proposal, battling to stop Congress from passing the bill allowing the flooding of the valley. He argued that the "Hetch-Hechy Valley is the most beautiful tract in that wonderful region. It belongs to the people and should forever be preserved to the people as a source of health and pleasure." Others had different ideas about what the purpose of conservation actually was, including Lehigh University President Henry Drinker. ← What did Conservation mean at Lehigh?